Set in the author's native Netherlands, The Dinner begins with two couples meeting for dinner at an exclusive restaurant, the type of restaurant in which the maitre d' points at each tiny item on your huge white plate with his little finger and tells you its provenance. Paul Lohman, the narrator, is a teacher and apparently out of work; his brother Serge is a charismatic politician set to be the next Dutch Prime Minister if his election campaign goes to plan. Their wives are intelligent and attractive; the foursome talk about wine and the latest Woody Allen film. And yet beneath this smug, affluent facade there is a terrible secret. Is Paul really the only one who knows what the two couples' teenage sons were up to on the night a homeless woman was violently murdered? And to what lengths will two liberal, middle-class couples go to protect their children, re-evaluating and re-justifying their values as they go? The Dinner proceeds fairly slowly at first, and I did find myself becoming a little impatient with Paul, the narrator, as he spends several pages voicing his resentment of his more successful brother and of the overpriced restaurant itself. His observations about Serge and his wife Babette, the pretensions of the restaurant and other minor irritations are sharp, but it's not really enough to sustain the opening chapters and it's really only once the central secret is revealed to us that the novel really gathers pace. As it does so, we begin to learn that not only are the four adults are not only keeping a terrible secret from the police, but that they're also keeping secrets from each other, and each small revelation builds another layer of intrigue into their already strained relationship. Perhaps most interestingly of all, we also start to learn more about Paul himself - and it's this that raises all sorts of questions about his reliability as a narrator and his own influence on his teenage son. 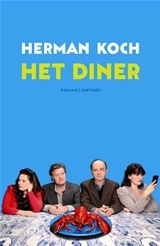 I liked the way Koch sometimes subverts stereotypes in The Dinner - Paul isn't quite the affable Amsterdam liberal he likes to present himself as. His wife and sister-in-law also begin to adopt some frankly disturbing views as their sons' terrible act is discussed, and Serge, painted by Paul as the very portrait of a dishonest, pretentious politician who prides himself on the common tough, might just turn out to have more principles than the lot of them. The two boys, too, although their role in the story is actually rather small - the novel being about the fall-out from their crime, not the build-up to it or the reasons they might have had for committing it - are also refreshingly normal and outwardly pleasant; they're a long way from being binge-drinking thugs. Ultimately, I don't think this book really stands up to Lionel Shriver's We Need To Talk About Kevin, to which it's been compared: it just doesn't have the same depth and full-on attention to detail. Others have compared to The Slap, another novel of middle-class smugsters' lives turned upside down; I couldn't comment because I haven't read that one. But The Dinner raises some interesting questions and works both as a social satire and, towards the end, edges towards thriller territory too.